The DSM-5 defines a mental disorder as "a syndrome characterized by clinically significant disturbance in an individual cognition, emotion regulation, or behavior that reflects a dysfunction in the psychological, biological, or developmental processes underlying mental functioning." The DSM does not emphasize the word reflect. It seems, as many words in this impressive work of intellectual and medical ingenuity, to be taken evidently, one would say almost naturally. However, one must stop and reflect on the role the word plays within the structure of the definition itself. What is reflected? In what way a dysfunction can be reflected? Is the dysfunction itself a primary phenomenon or is it a secondary, a dys-function, making the function the initial structure of the human psyche? A reflection can also mean a "careful or long consideration or thought." The syndrome may be reflected by the function in the sense of being produced by it in the process of thought itself. If that is the case, then mental functioning is preceded by thought itself. Mental disorder would be a syndrome produced by thought that itself reflect thought. It would be chained, as always, not to biology but to the processes that we understand as thought and its working. Hence, philosophy, as that knowledge that see thought as its primary domain and reflection as its main tool of action, will always be able to challenge, though in ever diminishing ways, the biological-natural will to power of psychology. It may be a marginal philosophy; one that is always minor, minimal, that takes place on the margins of the pages, in the white spaces between sentences, but it would always challenge, undermine, deconstruct. It would be a new philosophy, a philosophy that has lost its claims of faithful representation of thought itself, that is satisfied revolving that which cannot be put into words, that which this new tradition has named madness. A philosophy that Angelos Evangelou calls "autobiographical philosophy" in his impressive articulation of the relation between French Post-structuralism and Nietzschean madness, Philosophizing Madness from Nietzsche to Derrida. Autobiographical philosophy as Evangelou terms it is not autobiography, nor should it be understood as a philosophy of autobiography. It is not a biographical analysis, subjecting the philosopher's life to scrutiny as the key to the oeuvre, nor the oeuvre as a key to the life. Autobiographical philosophy is that philosophy where a life becomes a text and a text becomes a life, when one is no longer distinguishable from each other. It spring forth from what Evangelou terms as the "Nietzsche event" and Nietzsche famous saying that his hypothesis is that the subject should be understood as a multiplicity. The Nietzsche event is that event which Nietzsche becomes, a multiplicity of circumstances that fuse together his life and his work until no such distinction is valuable any more. According to Evangelou the Nietzsche event is that event that combines three elements that coincidentally come together due to the contingent fact of Nietzsche's collapse in Turin in 1889. (a) Nietzsche developed and was committed to a radical critique of Enlightenment philosophy. Even though Nieztsche did not attach positive value to madness as such, his transgressive philosophy enacted what it means to be mad within and for philosophy. (b) Nietzsche, specifically in his later essay Ecce Homo, brings his life (bios) into his philosophical practice, thus creating an auto-bio-philosophy. (c) Nietzsche is the philosopher that went mad. Evangelou is careful here not to give, as he claims Foucault does, a transgressive-positive value to madness or even to Nietzsche's madness. Nietzsche happens to go mad. 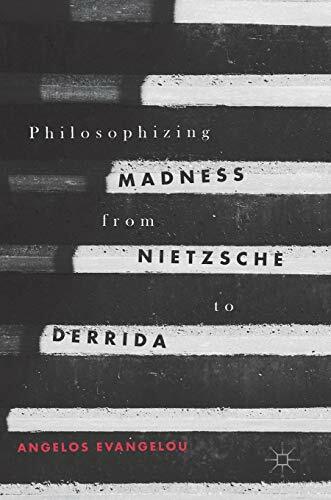 However, he wants to suggest that the fact of becoming mad (not Nietzsche's madness as such) has a philosophical value to it: it introduces the question of madness into philosophy and suggests the implicit possibility of madness when logos and bios become one. Nietzsche's madness itself illuminates his becoming mad as a process of an ongoing equivalence between logos and bios through the disintegration of auto as valuable to philosophy. However, because Nietzsche's madness reduced him to silence and oblivion, it was Nietzsche's "philosophers of the future" that were to rise to the task of making of madness a philosophical thing, specifically Georges Bataille and in his footsteps Foucault and Derrida. Philosophical madness is not mental disorder; it is that which constitute the limit of philosophy, the limit of the logos, where all meaning disintegrate and reason is shown to be no more than a flickering candle in a dark and windy night. However, the philosophical question of the truth or the value of madness for philosophy is not the question asked by Evangelou. He elegantly shift the question from 'what is madness?' to 'why is madness important for philosophy?' knowing quite well that the second question not only avoid the conceptual rivals of philosophy (biology, medicine, psychology or neurosciences) but immediately implicate the subject within the body of the question. Asking 'why madness?' implies asking why is madness important for Angelos Evangelou as a subject that is both a singular life and a philosopher. The book is divided into five parts. A clear short introduction, which presents the argument detailed above, opens the book. The first four parts are dedicated each to one of the four thinkers making up the structure of the work. The first part, "Friedrich Nietzsche: Madness and the Limits of Becoming", is dedicated to a construction of the basic structure of the argument presented in the introduction, that madness for philosophy is the limit of becoming. The limit itself of the possibility of philosophical discourse that becomes experience only when bios and logos overlap, when the work and the life of a philosopher collapses into each other and the only remaining possibility is the silent scream of the impossibility of a stable, coherent text/self. It is not an overview of Nietzsche's life or oeuvre, but the way in which toward the end of his productive life, his work and his life became one. The argument is supported by a convincing and precise interpretation of Ecce Homo. Following Derrida's famous critique of Foucault and the Cartesian moment of the exclusion and the silencing of madness, Evangelou takes Derrida's side claiming that Foucault's is mistaken by precisely thinking that madness can be an outside to reason which one can narrate. A mistake Derrida never makes since for him, as made clear in the quote above, madness is always a disturbance within the philosophical discourse of reason itself. Overall, Philosophizing Madness, is an impressive feat of scholarly erudition. Evangelou, though a lecturer in Comparative Literature, has produced a work on an intense philosophical character debating one of the more crucial questions in contemporary Continental philosophy (in its French form). The exposition of Bataille and Derrida's thought is extensive, and even though that of Foucault is limited to mostly his early work, the general argument for autobiographical philosophy is maintained throughout the book. Nonetheless, if there is a critical point to be made here, it is that Evangelou intentions and words do not coincide. While is intention is to support and develop the idea of autobiographical philosophy, a different form of doing philosophy where bios and logos are taken as a whole; his words remain very much philosophical in the traditional sense of the word. It is unclear in what way Philosophizing Madness is or if Evangelou intends it to be a case of autobiographical philosophy. If it is meant as such it fails to do so; if it does not, then what is autobiographical philosophy except the way Bataille, Foucault or Derrida did philosophy? Can we do autobiographical philosophy or is it just strange school of thought meant to be covered and exposed in scholarly works of intellectual history?